Born in New York and raised in the Marco Island/Naples area of Florida, Jordan is the son of one of Florida's top-producing real estate brokers. Over the years he has seen many aspects of the business, from new development to commercial and residential buying and selling. Naturally, Jordan gravitated towards real estate in the most vibrant market in the world, New York. 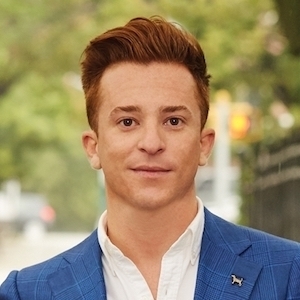 Shortly after beginning his career in real estate, Jordan joined The Vickey Barron Team - one of Manhattan's top producing teams. "No two clients are alike," he says. "By getting to know your specific needs, wants and lifestyle, I can easily tailor my services to suit your needs and provide an exceptional experience, culminating with unsurpassed results." An alumni of the University of Miami, Jordan dual majored in Creative Advertising and Photography. Having previously worked at both a luxury communication firm and InStyle Magazine, Jordan has a distinct edge and a keen eye for marketing his listings. Jordan enjoys consulting clients on the potential of raw space, and how to transform a property to maximize a home's potential value. Jordan's personal interests include interior design, photography, and the arts. Jordan can be found spending quality time with his rescue dog, Myrtle, in the various neighborhoods of Manhattan.